FILE - A Vietnamese boy holds a banner during a rally denouncing recent mass fish deaths in Vietnam's central province, in Hanoi, Vietnam, May 1, 2016. Tho show their solidarity, Taiwan-based Vietnamese workers took to the streets of Taipei on Monday. Taiwan-based Vietnamese workers took to the streets of Taipei on Monday to protest a Taiwanese firm they say caused mass fish kills along Vietnam's central coast. Some demonstrators also accused government officials in both Taipei and Hanoi of a sluggish response to the environmental disaster. In solidarity with demonstrators who rallied Sunday in major cities across Vietnam, Vietnamese laborers carried banners protesting Taiwan's Formosa Plastics (TFP) outside the offices of Taiwanese President Ma Ying-jeou. The small but vocal crowd was joined by fellow migrant workers from Indonesia, the Philippines and Thailand. 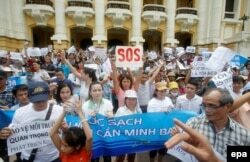 According to an Associated Press report, although a probe called by Hanoi officials has yet to link the massive fish kill to a $10.6 billion steel plant run by a branch of TFP in Ha Tinh, "public anger against the company has not abated." While Vietnamese news outlets did not cover Sunday's protests, which are rare in Vietnam, the AP report says hundreds gathered in Hanoi holding banners that read "Formosa destroying the environment is a crime" and "Who poisoned the central region's waters?" FILE – Demonstrators protest against Taiwanese enterprise Formosa Plastics, saying they are demanding cleaner water after massive fish deaths in recent weeks, in Hanoi, Vietnam, May 1, 2016. "We organized this rally to voice our concerns on the devastating damage to our environment, which is detrimental to our people's life, and especially to the maritime ecology of Vietnam," Reverend Peter Nguyen Van Hung, a Taiwan-based Australian-Vietnamese Roman Catholic priest and human rights activist, told VOA. "We would like raise awareness amongst the local people and of Vietnamese workers in Taiwan about this disaster." While television news programs in Taiwan reported on the mass fish death in central Vietnam, "they did not link this to Formosa steel plant. Formosa in Taiwan has already said that they are not responsible for the operations of the Formosa steel plant in Vietnam,” he said. Nguyen, who organized the Taipei protest, said thousands have signed a petition asking the World Health Organization to assess Formosa’s impact on the health of residents who live near the steel plant. Nguyen also said he fears Vietnam officials will "sweep the problem under the carpet," and not tell the truth about any role the Taiwanese steel plant might have played in the disaster. "I hope that Vietnamese youth will gradually wake up, and be less apathetic to the problems facing the country," said Nguyen, who in 2006 was honored by the U.S. Department of State for his activism against human trafficking. "We workers in Taiwan also would like to send a message to our people in Vietnam, that we are concerned about what is happening inside the country, that we are ready to walk with them in the fight for the truth, for equality, for justice, so that future generations of Vietnamese will have fish to eat, beaches to swim in, and a clean environment for living." Numerous people took to social media to voice their anger about the government’s alleged lack of action and transparency. This report was produced in collaboration with VOA's Vietnamese Service. Some information for this report was provided by AP.